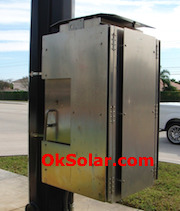 Nema Rated Enclosures, Nema Outdoor Telecom Enclosures and Cabinets. Click here to see more Enclosures Traffic, LTE, 4G,Wimax, Telecom, Security, Traffic, OSP Outdoor NEMA 3, 3R, 4, 4X Cabinet Enclosures. Click here to see more Aluminum Battery Enclosures.